Home Tags Posts tagged with "missing pilot"
Photographs taken moments before the World War II-era plane went out of control during Reno air race appear to show the pilot was unconscious, according to aviation experts. According to investigators, the age and medical history of 74-year-old pilot Jimmy Leeward may also prove relevant to their investigation. 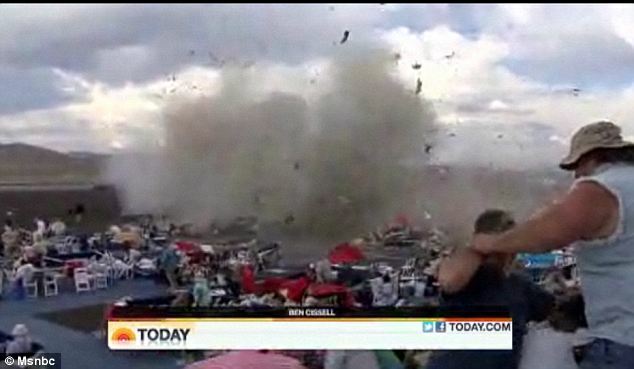 A 10th person died overnight from injuries suffered Friday at Reno, Nevada air racing tragedy. Saint Mary’s Regional Medical Center spokeswoman Jamii Uboldi said Monday morning the patient who died was male, but she couldn’t immediately release his name, age and hometown. ABC News consultant and former pilot Steve Ganyard said that after examining images of the plane before it hit the ground, it appeared Jimmy Leeward was not conscious. “There is no pilot’s head in that cockpit. The video was shot by a member of the crowd and shown this morning on NBC’s “Today” program. The news came as it was revealed the aircraft had undergone substantial changes since it was first built in the 1940s, which were done to improve the planes speed and not its safety. Shattered pieces of the P-51 Mustang’s tail have been recovered that may explain why the pilot lost control. Investigators with the National Transportation Safety Board (NTSB) said on Sunday the memory cards will be analyzed to see if there is any footage from the outward facing camera. Before it crashed, the aircraft also sent information to the racing team crew including oil pressure and temperature, altitude and velocity. That information could help investigators determine what caused the plane to crash. Investigators said they have not yet been able to verify reports the pilot sent a mayday call before crashing. The 65-year-old Galloping Ghost underwent years of massive overhauls that took a full 10 feet off its wingspan. The ailerons – the back edges of the main wings used to control balance – were cut from about 60 inches to 32. Before he died, Jimmy Leeward had said the changes made the P-51 Mustang faster and more manoeuvrable, but in the months before Friday’s crash even he wasn’t certain exactly how it would perform. Officials have been focusing on the “elevator trim tab” – a piece of the tail that helps the aircraft maintain lift and appeared to break off before the crash. The aircraft impacted on the tarmac like a missile, leaving a three-foot deep crater with debris scattered for an acre around the site. A picture taken moments earlier shows the tail piece missing. From a tour of the site Saturday evening, it appeared that the plane went straight down in the first few rows of VIP box seats, based on the crater’s location. Investigators also found several pieces of the doomed plane’s tail on Sunday as they resumed their search. Reno police also provided a GPS mapping system to help investigators recreate the crash scene. Investigators said they also recovered part of the tail section, where the tab is located. As investigators look for answers, a photograph has emerged showing that a piece of the tail was missing before the aircraft plummeted to the ground. “Pictures and video appear to show a piece of the plane was coming off. 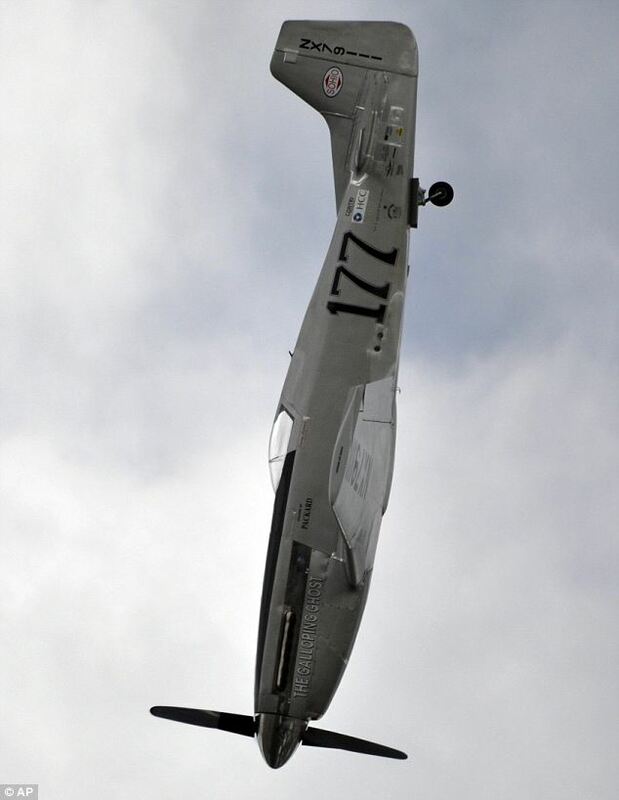 Tim O’Brien from Grass Valley, California, who is chairman of an air show in his hometown and photographed Friday’s races, took the picture which shows the part missing. He said pilot Jimmy Leeward’s P-51 was racing six other planes and was in the process of moving from third place into second when it pitched violently upward, rolled and then headed straight down.